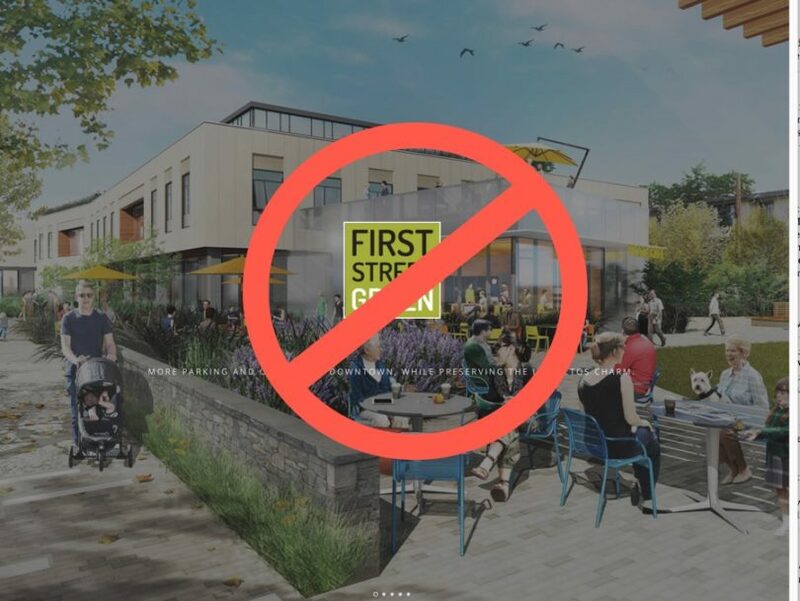 If you are unfamiliar with the LACI proposal you can see rendering of it on firststreetgreen.com. Or there is a video at the end of this post. Want to oppose the project? Maybe you want to sign a petition at preservelosaltosnow.org ? 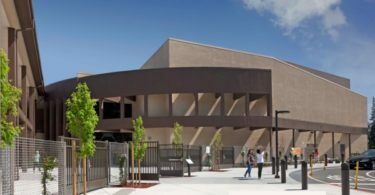 Let’s walk away from the Exclusive Negotiating Agreement (ENA) which explores the feasibility of a Public Private Partnership to develop a public green on City Parking Plaza 7 and a private commercial building on 8 parcels across from Safeway — a proposed 3-story, 77,000 square foot office building. The LACI proposal is a bad deal for the City and its residents. LACI is receiving much more than they are giving. 1.LACI wants to use our public land for private benefit. Los Altos has less public land per capita than any of the surrounding communities. We as a community already went through a painful experience when LASD wanted to get their hands on our public land. It is time to walk away now. There should be no reason to negotiate away, trade, sell, or be sold on the idea that our land is available to private developers or the consortiums made up of LACI., Saris Regis, Venture Fund ( which is a 501© 3 public charity which currently has a third party agreement with the Anne Wojcicki Family Charitable Fund) , and Jason Libor of Redwood Pacific Management LLC . 2.The LACI parking proposal map, clearly shows [some of] the parking for private LACI tenants on two levels of underground parking located on [underneath] our public land. Level 2 parking for private LACI tenants would use City underground land. The public parking would take all but a couple of stalls on level 1 … as currently proposed. 4.A 45’ high building will be overly intrusive on the neighboring condo residents. It will distract from the village character, and small town feel of our community. I am asking Council to stick to their word and keep the current 30’ height restriction for commercial buildings on First Street. As you know, the experiment in allowing 45’ high buildings on First Street failed. The Downtown Building Committee recommended 30’ to avoid the canyon effect, and City Council voted to support the residents in their desire to lower the building heights. First Street is a narrow street and a third story just does not disappear [ from pedestrian view even if set back ]. We need to trust the City Council, that when they vote to change the zoning laws, they will stick to their beliefs. 6.The LACI proposal is NOT a gift. If LACI wants a plaza they should build one on their own land. There is nothing philanthropic about using public land for a LACI First Street Green project. LACI sees the clear benefit to their project for themselves. If they did not see these as huge advantages they would not be spending tons of money on marketing campaigns, cocktail parties and private surveys. If LACI did not see…huge advantages they would not be spending tons of money on marketing campaigns, cocktail parties and private surveys. 7.Located on our land is not only an underground parking facility , but also Exit and Entrance ramps, and elevators and elevator shafts as well as stairwells for LACI tenants to use. 8.As I am sure you know the plaza cannot legally be the public benefit. There is a clear linkage between the plaza and the building. There is no doubt that LACI will benefit. By law, the “mother company, LACI is not allowed by the IRS to benefit from their 501c3 nonprofit company. Please do not close your eyes to the obvious linkage. 10.If we as a town want more open space and events, we should focus on the park land we already own. Open space, should not just benefit a few business owners downtown, but all residents across the entire town. I do not think we should be encouraging our children to hang out downtown next to underground parking garages. Our children should be involved in supervised school events, community center events, sporting events and charitable activities. We still have an understaffed police department with little ability to monitor activities underground at the LACI First Street Green project..
We still have an understaffed police department with little ability to monitor activities [and our children] underground. 11.LACI claims that their building and the LACI First Street Green will generate $1.2 million dollars in annual retail sales. Yet they have no way to prove it, nor should it be a consideration. Most new companies provide perks to their employees, such as free meals, snacks, massages, dry cleaning and work out space, to kept employees inside the building. There is no guarantee any additional sales revenue will be generated. Bill Lee ( RRM ) said in his financial analysis that downtown is already growing 50%. 12. At the City Council Retreat, Council agreed on its Priorities for 2017 and the LACI First Street Green project is not a priority. Chris Jordan persists in trying to make it a priority. It is perceived, for unknown reasons, he is touting the benefits of the project. Mr. Jordan should be representing the people of Los Altos and remain objective. We have just started the Downtown Visioning, and it is premature to move forward on an ENA prior to getting feedback from many of the residents, not just a small group of downtown land owners. We have just started the Downtown Visioning. It is premature to be negotiating with LACI prior to getting feedback from many of the residents, not just a small group of downtown land owners. 13.At the last PTC meeting, titled Design Review. There was no design review of the LACI building. No slides were presented by staff where the attendees could see the plans submitted to the City. 14. I sat with Zack Dahl and looked at the proposed building. It looked like an elongated shoe box, with another elongated shoe box for a second story and a third elongated shoe box for a third story. There was little articulation. It was clear that First Street is 5’ higher than Second Street. This would make the building five feet taller than the 45’ LACI is requesting. The condos located immediately behind the LACI project would live in shade all day long. 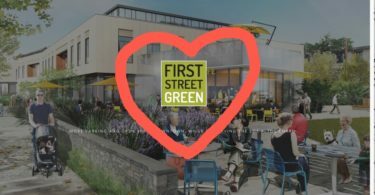 First Street Green Concept May 2017 from First Street Green on Vimeo. The Virtual Video from LACI First Street Green project group was deceptive. It made Shasta Street, First Street and the alley behind the building appear much wider than they are in reality. The drawings and video showed oversized windows all along the rear of the building, having the office lights shining into the condo apartments. In winter, the residents of the condos would have little privacy and would need to close their curtains to prevent office workers from looking into their dwellings. The perspective was horribly off from reality. It was not a realistic view of what the human eye would actually see. 15. Lalahpolitico: Besides Roberta’s concerns above, here’s a concern I hear: This project and its alleged benefits — a private public partnership — not only will be very complex for Los Altos hayseeds to negotiate and not get fleeced…but with so many moving parts, changes to the plan will drift such that LACI gets more benefits and the residents less. Bait and switch may be a real thing. Trust of developers is low. [Lalahpolitico: Yes. Consider the new First Street Safeway. The FINAL approved plan had parking on the roof, and the store on the ground floor with 3 mini shops in ground floor windows along First Street. Lovely. Unnoticed by almost everyone, the plan was flipped – the store went to the second floor while the parking went to the ground floor…not a very pedestrian friendly outcome… and many call the resulting downtown First Street Safeway ugly.